Trundling down the Avenue of the Volcanoes we were treated to yet more spectacular scenery through the window of the bus on the way to Baños. 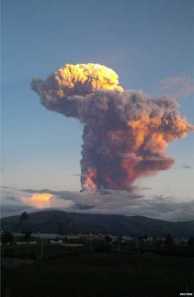 Just a few days previously I had received a flurry of messages from friends and family who wanted to know that I was all right as the Tungurahua volcano had erupted. It has been rumbling away for a few years now, every so often sending plumes of flame and ash high into the air, causing roads to close because of lava flows and villages and towns to be evacuated. 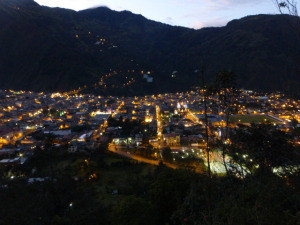 Web sites were advising us not to travel to Baños at the moment – but every Ecuadorian that we asked looked at us as if we were mad and raised their eyebrows. I guess they live with the threat of volcanic eruptions, earthquakes and tsunamis every single day and if they were to put their lives on hold with every tremble and puff of smoke they would never do anything, so off we went. The bus wound its way around and down the side of the valley, crawling like a tiny and insignificant beetle against the side of the volcano and we were deposited unceremoniously in the drizzle at the terminal. Resembling a beetle myself with my large rucksack and smaller pack worn on my front we crossed the main plaza in search of our hostel. 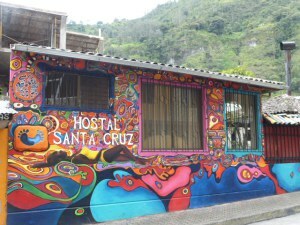 The Santa Cruz Hostel is situated behind brightly painted walls very close to the town centre. The rooms were contained within two separate buildings which were separated by another small plot, but both had chimneys/open fires, self catering and kitchen areas and TVs. There were some little gardens with hammocks and security was very good with large metal gates. 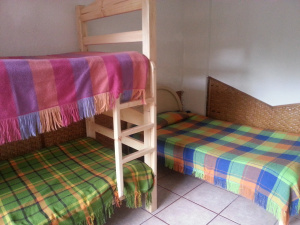 Myself and M were given a triple room – containing bunk beds and a wide single bed and although small small it was very clean. We were on the ground floor and outside on a little patio area there were deckchairs and our own hammock. A covered courtyard at the front contained plenty of tables, chairs and seats, a television and a computer and a large raised open fireplace, together with a good supply of logs. The receptionist Monica Flores was super friendly and the cleaning staff thoroughly cleaned all of the rooms including the windows when guests checked out. 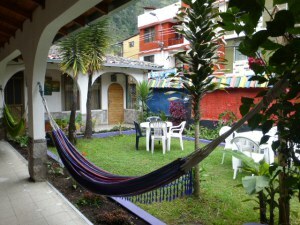 We had just got ourselves settled when a friendly face from Quito turned up and checked into the room next door. H had arrived, fresh from climbing up to the snow capped rim of the Cotopaxi volcano. We were to share a bathroom with him via a little interconnecting corridor, so leaving him to freshen up and sort himself out we set off to climb our own mountain. I am not sure how far we clambered but it took us an hour. We made it up to the very top where a large illuminated cross stands and we were rewarded with a great view of the town just as dusk was falling and all the lights began to twinkle below. We then realised that we had to get back down the very muddy, slippery path and didn’t have much time as the twilight would rapidly be turning to dark. We got down in record time – in just twenty five minutes although we covered the last few hundred yards in the pitch black. To reward ourselves, me and M took ourselves off to the hot springs. 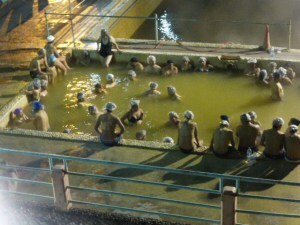 Fed by natural hot water which came from deep in the volcano we joined hordes of other people in the large pool. It was busy but very calm and relaxing as people were content to sit neck deep on the ledge around the sides, gossip with neighbours and generally absorb the atmosphere. 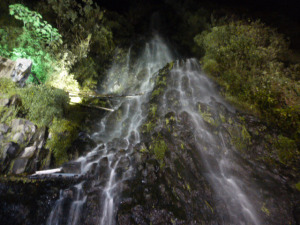 The complex was situated at the bottom of a waterfall which crashed loudly down the sheer mountainside, and which was lit up with pretty coloured lights in the dark. Steam rose from the hot water into the cool night sky. 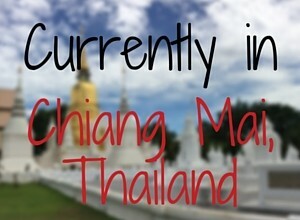 The water was a dirty sandy colour but it had a very clean, metallic smell and it was as hot as a very hot bath. After a while we went to investigate the smaller pool. I dipped a toe in and I almost fainted. It was scalding. I managed to get in up to my thighs but I couldn’t manage anymore. We were quite the celebrities and the locals were all giving us advice and laughing at our discomfort. Against my better judgement I decided to trust them when they persuaded me to sit up to my neck in the cold tank. They promised that it would help but I remembered from my physics class that this would only accentuate the heat. After I had turned numb from the cold I got into the cooking pool… and…they were right. It worked. I got in and I managed to stay in for about seven minutes before feeling my internal organs giving up, so with some approving smiles, I scuttled out as fast as I could. I sat by the crackling log fire and chatted to a couple from Toronto who were touring down through the Americas from Canada on their motorbikes. Adam and Jen had chosen the hostel to rest and recuperate and to do a little bit of work on their bikes which were locked securely in the courtyard. The best bit about travel for me is the people that I meet along the way and listening to their stories. 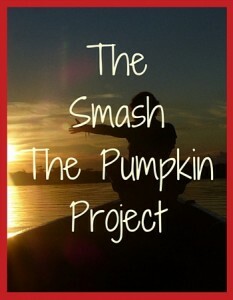 Everybody has their dreams and their reasons for travel and they are all interesting. The following morning M lost her tweezers. Hunting around the bedroom she swore that she had been holding them just a few minutes before. Giving up, she carried on getting ready to go out and then stopped. Laughing loudly she said, ‘Ooh, I think that I know where they might be. There is something hurting my foot inside my walking boot’. M had found her tweezers!! Baños is jam packed with activities for adrenaline junkies and whilst I am definitely not the adventurous type we did want to do something whilst in the area. The volcano was off-limits due to its current volatile state so we went to check out what Geotours had to offer. Guests at the Santa Cruz Hostel could get ten percent off here – along with a free bike if they stay at the hostel for four days or more. We had met Geovanny Romo the man in charge of the tour company the previous night because he is also the manager of the Santa Cruz hostel. I will tell you in another entry if I did in fact do that bungee jump, go canyoning or anything equally dangerous. Ow, rather you than me in that cooking pot! Fascinating though! 😀 And lovely descriptions. Those bedrooms always look so bright, airy and inviting.